LALITPUR, Feb 24 : The Patan Museum is currently working on to restore the historic Sundari Chowk located at the Patan Durbar Square back to its original shape. This historically important chowk (courtyard) was closed for the visitors as the District Police Office operated from this space. 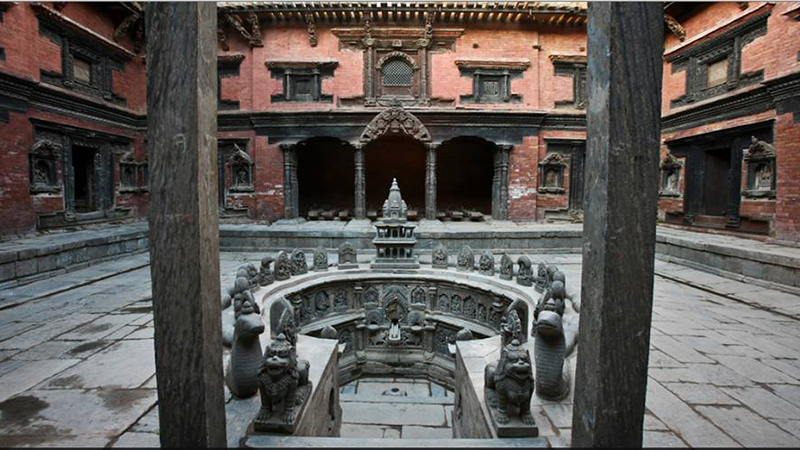 Out of the four such traditional courtyards within the premises of Patan Durbar Square, a World Heritage Site, the Sundari Chowk is the most artistic, Suresh Man Lakhe, the Chief of the Patan Museum, said. According to him, the traditional walls of the chamber would be left as it is while the floor would be daubed with mud and ochre to give the Sundari Chowk its original look. The mud-plastered walls have been only slightly repaired. Many of the walls have murals which have been kept protected by glass slabs. A window in the shape of elephant that is in the Chowk is also one of its attractions. "We have tried to preserve the artefacts and monuments that are here in their original form as far as practicable," Lakhe said. The visitors have to walk barefoot to see around the Sundari Chowk. Some cubicles in the Chowk are empty. The visitors can gain some knowledge from the intricately carved traditional windows, the walls and the floor of the Chowk. This Chowk which had remained closed for more than two decades was opened for the visitors only three years back.